A peek into the beehive reveals a chic environment that's straight of a minimalist's dream. (SPOT.ph) These days, it’s a lot easier to have things delivered straight to your door. There’s little to no need for you to get all dressed up and brave the Metro’s traffic to grab some food or shop for essentials, and Honestbee’s simple and efficient system makes it one of the most reliable delivery apps available in the country. Honestbee Philippines now caters to other essentials like medicing and beauty and personal care products. 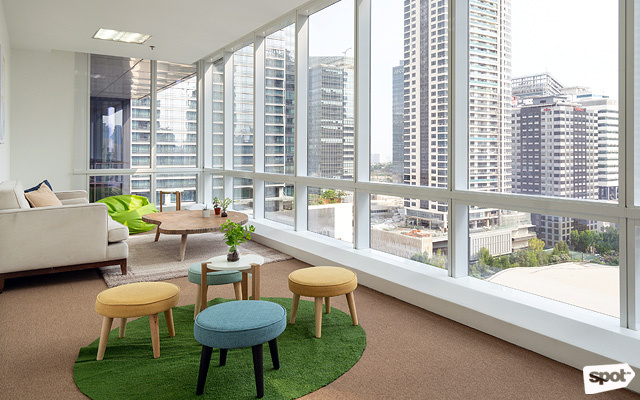 Located at the heart of Bonifacio Global City, Honestbee Philippines’ new office looks straight out of a minimalist’s dream board. Clean is the first word that comes to mind the first time you lay your eyes on its brightly lit rooms, but spend a few more minutes looking around and you’ll realize that there’s more to it than meets the eye. What started out as a small food and grocery delivery service in Singapore has now grown into one of Asia’s top concierge apps. Founded in 2015, Honestbee extended its reach to 16 cities across Asia in less than four years. 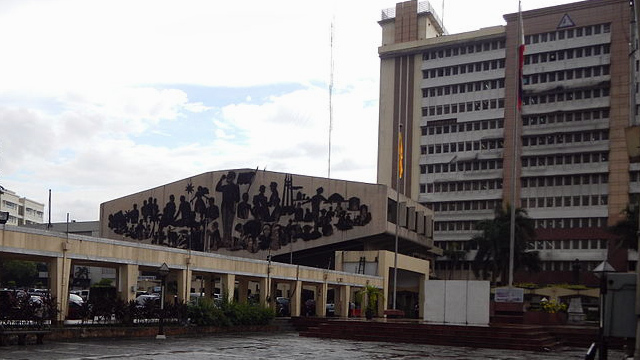 It launched in the Philippines mid-2017, but the small team managing it had only just moved into one of the floors of the Bench Tower early this year. The receiving area at the office lobby gives visitors a glimpse of what to expect inside. You'll spot these cute bee illustrations all over the office! Natural light from the floor-to-ceiling windows keeps the space bright and sunny. The executive area features a Scandinavian interior design that's easy on the eyes. 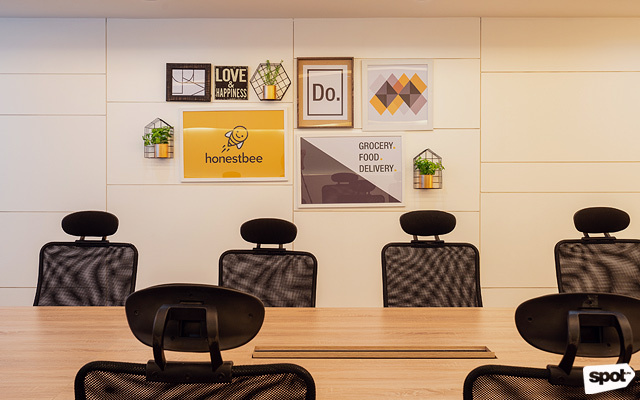 As the queen bee of Honestbee Philippines, Gonzales wanted the office to be a haven—a place where people can hang out and relax while working. For her, this means it should always be kept clean, organized, and free of clutter. 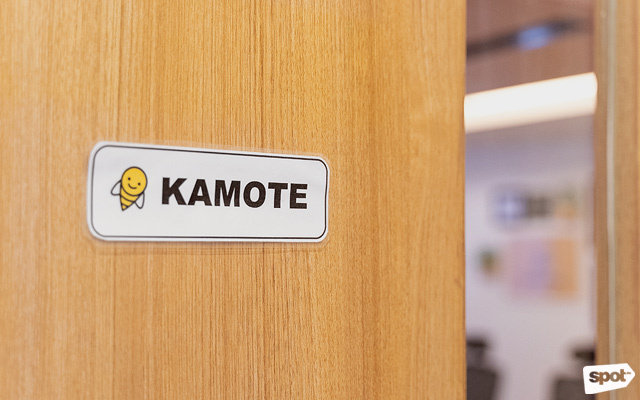 Encouraging their employees to bring only what’s necessary—one or two pens, a deskpad, a tumbler or a mug—they provided Japanese-style storage boxes so employees can keep their desks neat and clutter-free. 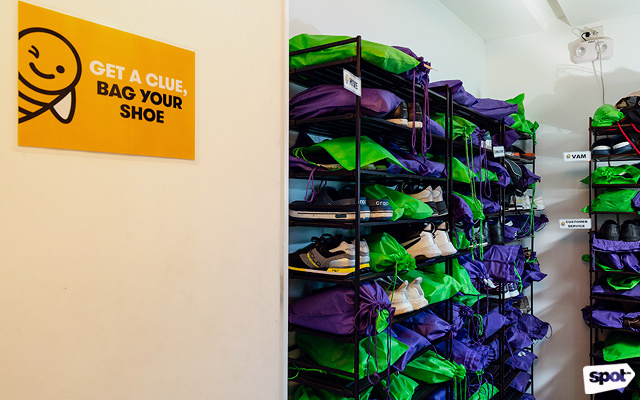 Employees keep clean shoes in the office shoe locker room so they don't have to bring an additional pair every day. But Honestbee’s simple and clean environment goes beyond mere appearance’s sake. The first thing visitors are asked us to do upon entering the lobby is to put on shoe covers. Employees, on the other hand, have to change out of their outdoor shoes and into their indoor pair, which are kept in the shoe locker room. 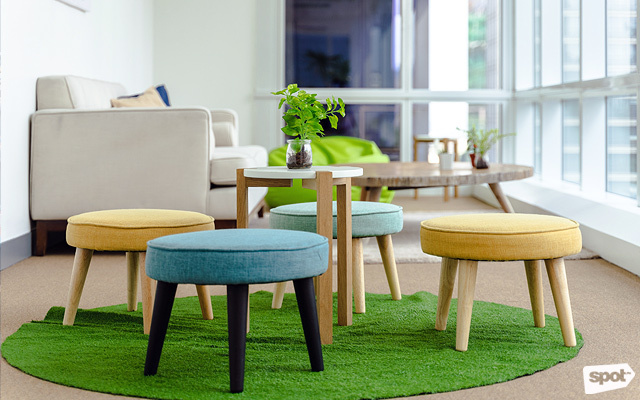 The mismatched furniture pieces manage to seamlessly work together. 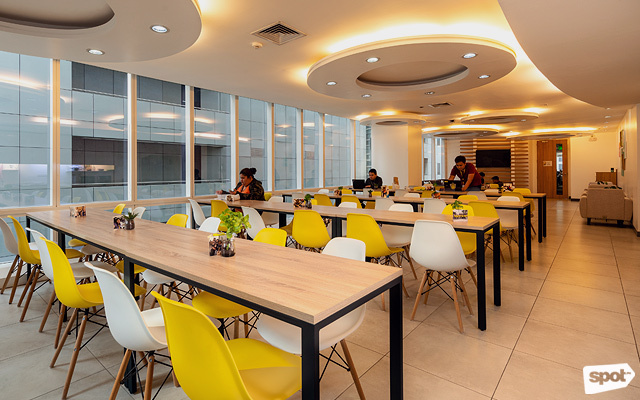 With its sleek design—and spotless environment—the Honestbee office looks less like an office and more like a modern café or study lounge. 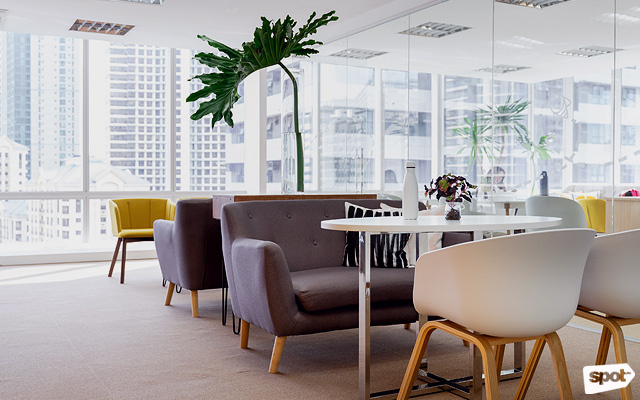 Desks are up for grabs at the open spaces, so even though people have their own designated spot, they’re still free to roam around and look for a comfier one to work in. They initially thought this area would end up being a "dead space" until they decided to make a creative area out of it. It's now one of the employees' favorite spots. 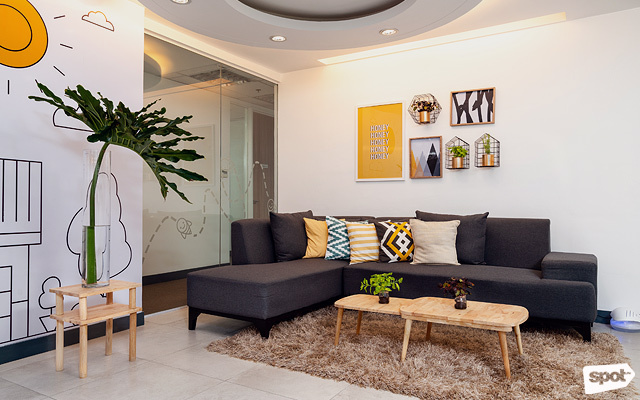 One of the employees’ favorite area is a small, creative corner originally designed as a children’s play area. 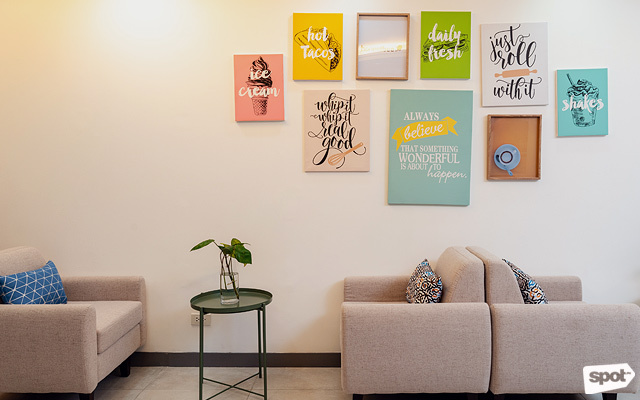 With a comfy couch facing tall windows and a laid-back atmosphere, the space is frequented by teams trying to brainstorm or people just looking to relax. The rooms are all named after Filipino produce. Employees are free to use the meeting rooms when needed. Fun prints and decor tie each room together. 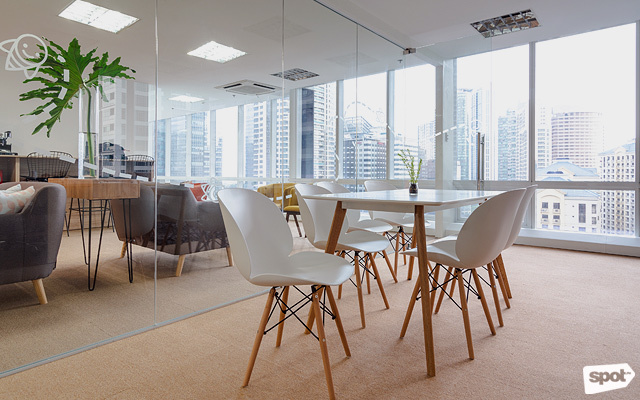 Gonzales likes to think of the office as a space for people to converse. 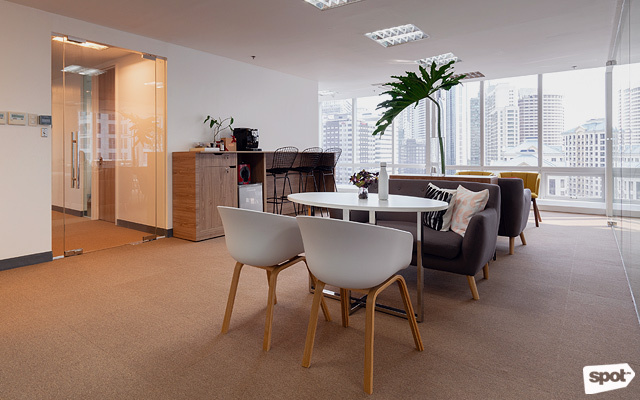 According to her, most of the work happens in their huddle spaces and meeting rooms, which are, interestingly enough, named after local Filipino fruits and vegetables. There’s kamote, duhat, siniguelas, and calamansi, among others. 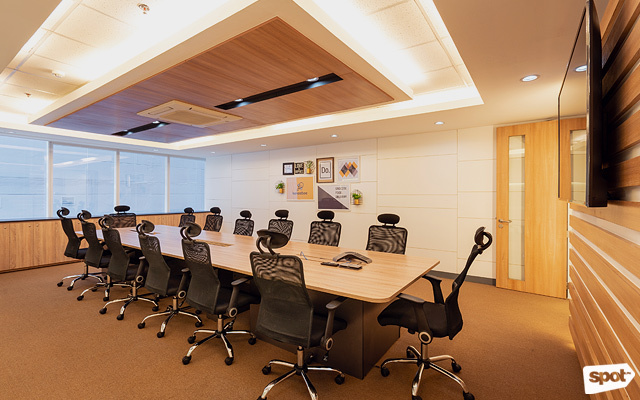 Some rooms are smaller, with round tables and just four seats; while the board rooms are for bigger team meetings. The pantry's cafeteria-style setup allows for different teams to get to know each other. Even the pantry was designed to foster conversations. "Actually, [the pantry] was initially set up differently. Like, all separate tables. 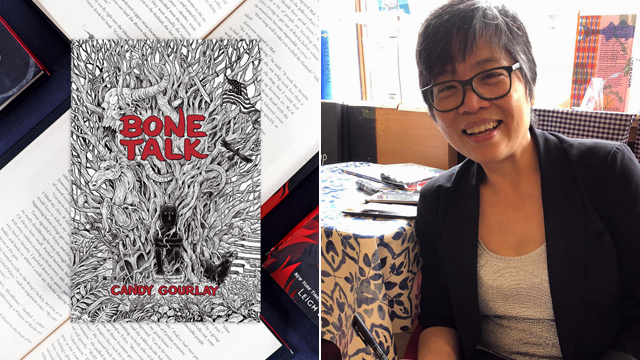 When I looked at it, it didn't feel right to me," she shares. "So we made it cafeteria-style because I wanted people to eat together and I didn't want anyone sitting alone." Group photos of employees make for quirky centerpieces at the pantry. Different teams get to interact with each other thanks to the long tables. 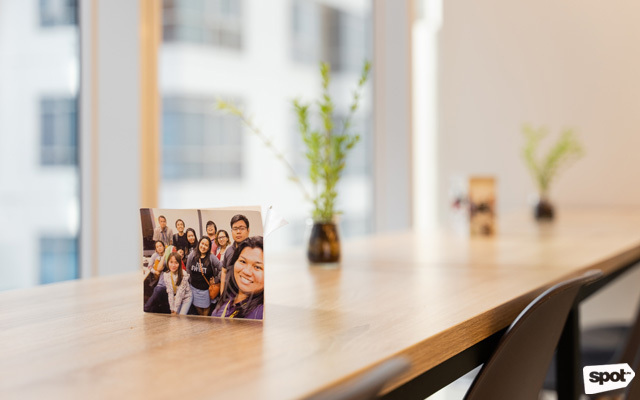 With natural light flooding through the floor-to-ceiling windows, the pantry is also one of the most homey spots in the office, and if you take a closer look at the table centerpieces, you'll realize that they're actually made out of different group photos of the employees. 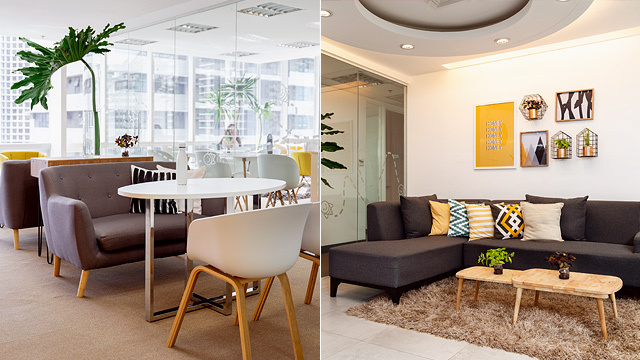 No two rooms look completely alike in the Honestbee office. Accents of pale blue and gray contrasting with the sunny yellow motif ties every room together, appearing as prints hanging on the wall, rugs and carpets beneath wooden tables, or even as the chairs themselves. 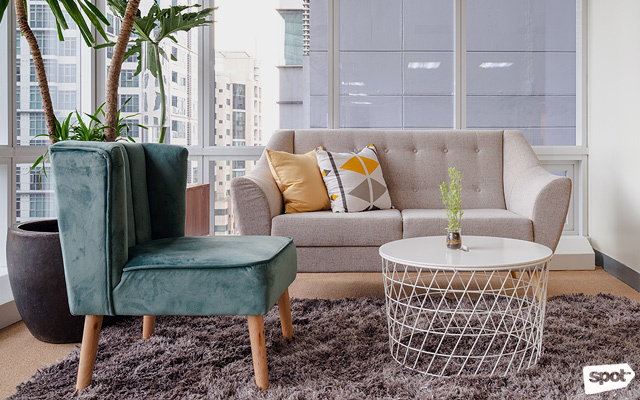 The minimalist aesthetic makes the rather mismatched details work seamlessly together, but each room looks different from the next—and this is probably because everyone in the office played their own part in designing the space. Just like the furniture, the prints and decor are hand-picked and bought from different stores. “It’s very Marie Kondo, but we really wanted every space to bring joy,” she shares, saying how that she wanted people to feel at home while keeping it all very minimalist. 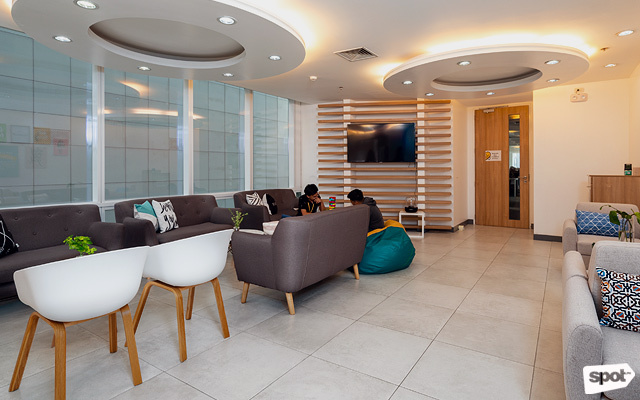 The Honestbee office is designed to be a space for people to truly thrive in; a space where one wouldn't mind spending an entire day. 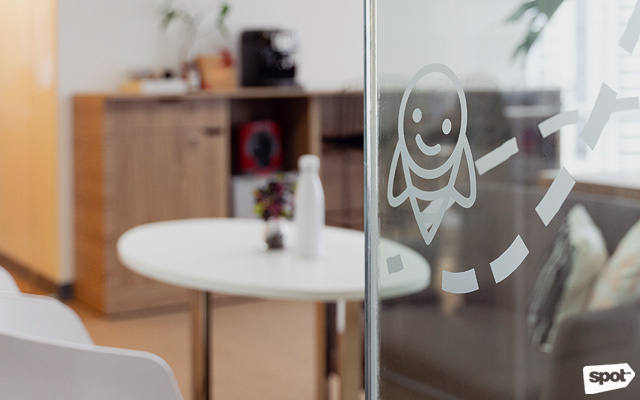 Just as bees are known to be industrious and organized, the folks behind Honestbee know how to keep the hive—or in this case, the office—alive and well. Or maybe it’s the office’s bright and sunny atmosphere that keeps everyone working at their fullest potential. 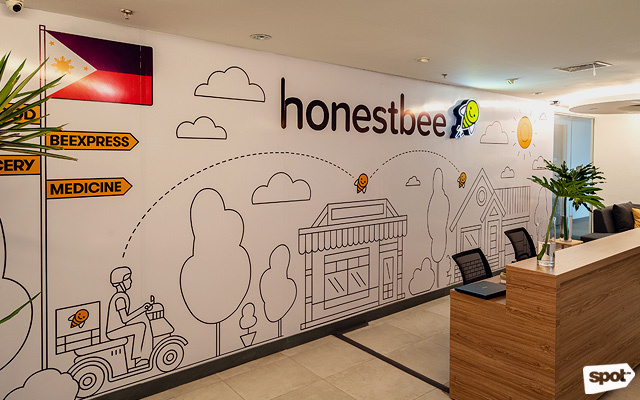 After all, with an environment that puts its people above all else, it’s no wonder Honestbee is good at what it does.